GBI offers traveling column machines from two world-renowned German machine tool manufacturers, Matec and SHW. Matec offers you tailored solutions including customizing modules built specifically for your workflow, materials and needs. 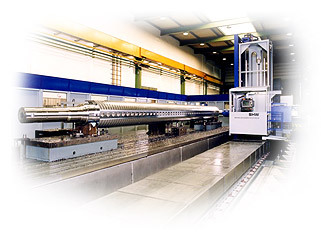 In addition, there are many different options available in CNC tables, 5-axis milling heads, drives systems and application specific peripherals. When you need large, powerful traveling column machines (30 m and longer in the X-axis and 4100mm in the vertical axis) that are required for high chip removal and for complex all round machining, SHW are the machines to turn to. Let one of GBI's machining experts help you select the traveling column machine that will optimize production for your application.